Watch Shop Sale has started early with 20% off savings across all watches! Why wait! Whether it's as a coming of age gift or just an everyday timepiece a watch is a key part of everyone's wardrobe. For many, choosing the perfect watch takes time and consideration, especially if it is a gift. The number one online source of watches in every hue, in a huge range of designs, from an incredible collection of designers, is the Watch Shop. Narrow your search by brand, style or price and you can be sure that Watch Shop will have the perfect timepiece for ladies, men and children. They also offer a beautiful jewellery range to complete your look. 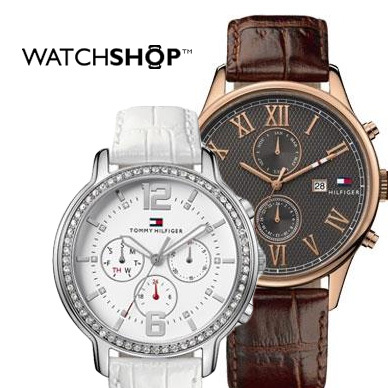 Add Watch Shop to your Favourites list and be the first to know every time they have a Sale on! 1st January 2018 - Watch Shop New Years Day sales for 2018. 7th May 2018 - Watch Shop Early May Bank Holiday sales for 2018, add to your diary now! July 2018 - Watch Shop Summer 2018 sales, joining us? 23rd November 2018 - Watch Shop Black Friday sales in 2018 start on Friday 24th November. Add products from Watch Shop to your Love Sales list. Get the Love Sales button now! Watch Shop January Sale has started early with 20% off savings across all watches! Why wait! Watch Shop Boxing day Sale has started early with 20% off savings across all watches! Why wait! Watch Shop Christmas Sale has started early with 20% off savings across all watches! Why wait! Watch Shop Cyber Monday Event has started early with 50% off savings across all watches! Why wait! Watch Shop Black Friday Sale has started early with 50% off savings across all watches! Why wait!